If you decide to start back home, turn to page 4. If you decide to wait, turn to page 5. So begins The Cave of Time, the first Choose Your Own Adventure (CYOA) book. The children's book series featured branching storylines that the reader could navigate, with dozens of possible endings, including many that resulted in the main character's death. The tagline for Choose your Own Adventure was You're the star of the story! The series, published in the 1980s and early 1990s, was wildly popular with middle-grade readers, with the more than 200 books selling more than 250 millions books worldwide. Though the choose-your-path genre of fiction is dominated by the Choose Your Own Adventure franchise, it wasn't originated there. The first interactive format fiction piece was "Story As You Like It," written by French author Raymond Queneau, founder of Oulipo, the French avant-garde collective of authors and mathemeticians focused on experimental fiction using constrained writing techniques. While the CYOA franchise was written for young readers, the format displays a surprising complexity and depth. Some of the books in the series had hundreds of possible branching points with nearly 40 different endings each. A plot analysis of the CYOA book "The Third Planet From Altair" showed the dozens of different branching plot points and possible endings. The popularity of the CYOA franchise spawned many imitators. 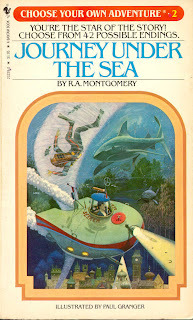 While none of the other interactive children's book franchises rivaled the popularity of CYOA, a sub-genre of interactive fiction books became popular in its own right: gamebooks. Adding additional rules like character creation or random dice rolls, the gamebook franchises became more like single-player role-playing games than mere interactive fiction. The most popular of the gamebook series was the Fighting Fantasy series, a series of 59 game books written by Steve Jackson and Ian Livingstone, co-founders of Games Workshop (confusingly, this is a different Steve Jackson than the American game designer responsible for GURPS, Munchkin and dozens of other card and role-playing games). Nearly as popular as Fighting Fantasy, and much more complex, was the Lone Wolf series of 28 gamebooks, which sold more than 9 million copies. Including detailed rules for character creation, combat and adventuring, each of the Lone Wolf books were a self-contained single-player role-playing game. Driven by nostalgia for the decidedly low-tech era of interactive fiction, the Fighting Fantasy gamebooks and the Lone Wolf gamebooks have been made available, free of charge, online. With the original Choose Your Own Adventure readers now having their own children, the franchise has been relaunched for a new generation. Of course that means questionable tie-ins and new formats, including on the iPhone, and on DVD. Hey, who wouldn't want to hear William H. Macy star in an animated Choose Your Own Adventure movie? And lest we forget, this was about the same time that Interactive Fiction (IF) on the computer was becoming a dying genre, being replaced during the Golden Age of Adventure Games, such as those from LucasArts, Sierra and Westwood Studios. I can't help but feel there's a connection there, like the medium of variable fiction morphed to something more luddite as computers became advanced enough to offer sounds and graphics. No doubt if something were ever to replace books, we would find Choose Your Own Adventure Pictograms scrawled in many of the world's more glamourous caverns. Though obviously, since this is a subject near and dear to my heart, a larger more comprehensive post is now officially on the burner. Also, insert rant about unoriginality, profiteering on our childhood, etc.etc. here. insert ironic comment on a choose-your-own-adventure book about writing a choose-your-own-adventure book here. Except actually, I'd totally read that. All about the combinations, and branching plot lines, and the various ways of creating one of these interactive fiction books. That'd be a pretty good read.